Mission Statement The Sedona Community Food Bank is a community supported organization which provides food and assistance to people in need. Specifically those who live in Sedona, Village of Oak Creek, Cornville or Page Springs. Please visit our Facebook Page at www.facebook.com/sedonafoodbank and LIKE us! The Sedona Community Food Bank currently operates at specific times out of the rear lower level of the Seventh Day Adventist Church at 680 S. Sunset Drive. Sedona Community Food Bank is in need of baby diapers in size 4 and 5 as well as containers of baby wipes. We also need personal toiletry items such as shampoo, conditioner, soap, deodorant, toothpaste, and toothbrushes. Please drop off at the food bank Mon-Thurs 7:30-12:30 and by appointment. Call 928-204-2808. Thank you! Sedona Community Food Bank needs BABY WIPES to provide to our clients along with the diapers so generously donated earlier this year. Please pick up packages of baby wipes (maybe a case or two?) the next time you go shopping! If you have any questions, please call. Otherwise, you may drop your donation off Mon-Thurs 8-12 at the food bank (in the lower level of the Seventh Day Adventist Church on Sunset Dr. in W. Sedona. Thank you! The school year is under way and every week Sedona Community Food Bank, in partnership with volunteers from faith-based organizations, fills 69 bags of nutritious, easy-to-prepare, often single-serving foods. These emergency food packs go to schoolchildren at West Sedona School and Sedona Red Rock High School who would otherwise go without adequate nutrition over the weekend. We always need food donations in multiples (dozens, cases, multi-packs). Peanut-butter & cracker snack packs; 100% Juice Boxes (no "juice drinks); individual sized cereals, fruit cups, apple sauces; granola bars. Or call Cathleen at 928-204-2808 to find out what we need most! 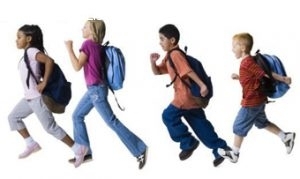 Alternatively, for $28, you can "sponsor" a month's worth of backpacks for one child! Why not make this a recurring donation and cover the whole school year? THE BABIES THANK YOU for the DIAPERS! Sedona Community Food Bank has many clients who have babies and toddlers and who need disposable diapers. Lately, we have had a shortage of diapers, so we would greatly appreciate donations of any size disposable diapers especially size 3. Thank you on behalf of our clients and their babies! Thank you to the two wonderful Spanish-speaking volunteers, Rosie and Helen, who heard the call and who are now volunteering at Sedona Community Food bank on our food distribution day. They are making the process so much easier for our Spanish-speaking clients and, because of that, it enables us to better server ALL of our friends and neighbors in need. Thank you! 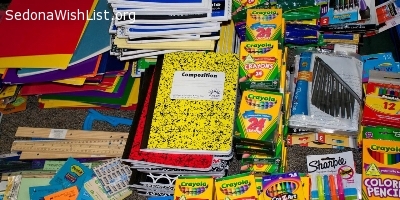 Some School Supplies in Short Supply! Help our School Supply Drive! Thank you to all of you who have donated to our 2nd Annual School Supply Drive for the Students at West Sedona School so far. We have a SHORTGE of the following items - check local sales for excellent prices on these supplies and consider making a purchase and donating to our drive! Bring them to Sedona Community Food Bank (lower level of the Seventh Day Adventist Church) Mon - Thurs 7:30-12:30. Questions? Call us at 928-204-2808. We will distribute the supplies, August 1 & 8. This distribution was a huge success last year. Thank you for making this year even better! THANK YOU, SEDONA for being so generous on Saturday, May 12, the day of the annual Letter Carriers' Food Drive! Thanks to you, over 12,000 pounds (so far) of food was donated. This will help us to provide much-needed supplemental nutrition to our clients, your friends and neighbors throughout the area. Thank you! Thanks to you, we helped our schoolchildren this year! Sedona Community Food Bank sends out a heartfelt THANK YOU to everyone who responded to our wish for supplies with which to fill all the weekend emergency food packs this year. Thanks to you, we received not only nutritious individual sized foods, but also financial donations which allowed us to purchase exactly what we needed in addition. The school year is nearing its end, but we'll start again in the fall and hope that you will continue your support then. 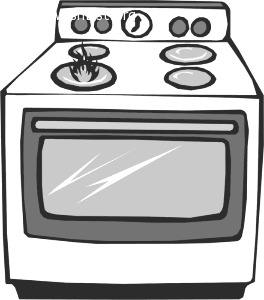 WORKING Gas Stove still needs a home! What a deal! Sedona Community Food Bank has a gas stove (and yes, it works!) which needs a new home! All you have to do is call us for details and arrange to pick it up. (If you can't pick it up, let us know - we'll see what we can do.) A donation to the food bank would, of course, be welcome, but not required. Call Cathleen or Dennis at 928-204-2808. 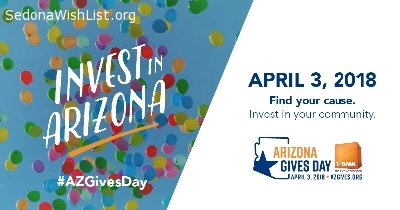 Arizona Gives Day 2018 is April 3! Sedona Community Food Bank wishes to remind everyone that Arizona Gives Day 2018 is right around the corner, on April 3! This 24-hours-of-giving will benefit local nonprofits like the food bank and will strengthen the community through group-giving and support! Folks who wish to to donate can go to https://www.azgives.org, search for the name of their favorite nonprofit and make their donation right then. The donation will not be processed until April 3. Please be generous and support the local organizations who do so much for our friends and neighbors! SEDONA COMMUNITY FOOD BANK thanks their friends at Snap Fitness West Sedona once again for the use of their photocopier in February and in March. This allows the Food Bank to make crucial copies of forms, brochures and other materials that are necessary for their mission of serving the hungry in our community and because of Snap, no funds are diverted from food purchasing. THANK YOU! thank you to our photo-copy donor! Every month Sedona Community Food Bank must run a certain number of photocopies for business, organizational, and informational purposes. 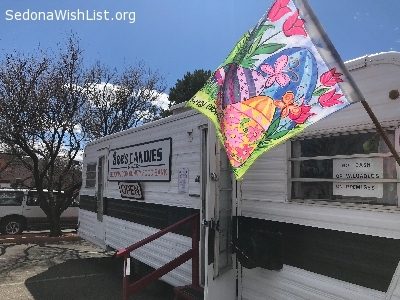 Awhile back, SNAP Fitness West Sedona responded to our Sedona Wish List wish and volunteered the use of their copier for these crucial copiers, saving us much-needed funds which can be put to use elsewhere, like buying food. Thank you, SNAP Fitness West Sedona, for being our ongoing photocopy benefactor! thanks to our new volunteer drivers! Thanks to Sedona Wish List, we have filled our need for a once-a-month volunteer to deliver much-needed nutritional food to homebound clients. In this case, we really scored, as a couple volunteered to work as a delivery driver team! Thank you, Sedona, thank you, Sedona Wish List, and thank you to our new volunteers! Once a month, on the 2nd Monday, Sedona Community Food Bank delivers much-needed supplemental food to homebound clients. We need one more driver to deliver to the clients on one route. Hours are approximately 10 a.m.-12 p.m. on the 2nd Monday of each month. Call Cathleen at 928-204-2808 for details. 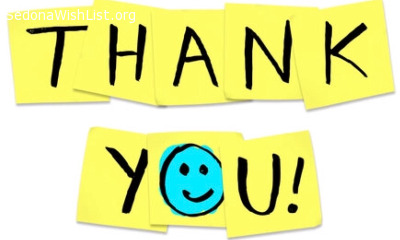 Another big "Thank You" to those wonderful people who responded to our Sedona Wish List wish for Monday-and-Tuesday volunteers. Thanks to you, we have a full complement of volunteers donating their time to helping our friends and neighbors in need. We couldn't do it without you all! Thank you. Thank you for our freezers! Back in November, when we had an urgent need for freezers, thanks to Sedona Wish List, our wish was granted and we received the funds needed to purchase new, energy efficient freezers which are now humming along keeping food safe! Thank you! Our Candy Wagon year a great success - thanks to you!! Thanks to all of you - customers, donors and volunteers (oh, you wonderful volunteers) - the See's Candy Wagon was a great success this year! It is closed up now until we reopen in November, but we wanted to send out a big THANK YOU for your work and support! All proceeds from the Candy Wagon stay in Sedona and benefit the Sedona Community Food Bank. See you in November! Fill a child's Weekend Emergency Food Pack every month! we have our adding machine! 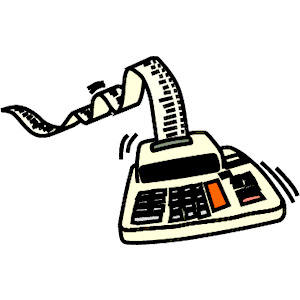 Another big thank you to the generous person who donated an adding machine which we needed very much! One runs out of fingers and toes when doing calculations sometimes. We appreciate so much the ongoing support and generosity of our friends and donors! Thank you to our Copy Donor, Snap Fitness W. Sedona! Sedona Community Food Bank sends out a big THANK YOU to Lin Ennis, Snap Fitness W. Sedona VP Operations and Marketing for fulfilling our wish for a copies donor! Thanks to Snap, we will be able to take care of our copying needs without drawing down resources better used for serving our clients. Thank you!! 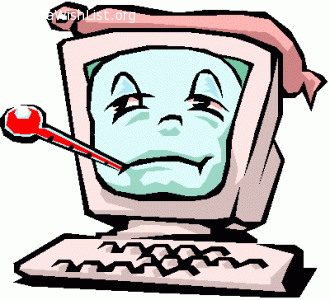 Thank you to everyone who contributed to our computer fund. Thanks to you, we have joined the rest of the world in 2017 technology and are much better able to serve our clients in need! For awhile there, we were in constant need of volunteers. 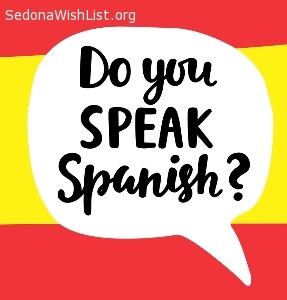 Thanks to so many of you - and thanks to Sedona Wish List - our volunteer needs have been satisfied and we have a terrific crew working to help our friends and neighbors in need. Bravo, Sedona!! The food bank has a lot of resource materials and announcements to share with our clients. In order to display these materials, we still need an portable, collapsible display easel to hold a 3 ft x 2 ft bulletin board! Please, no big heavy wooden easels. See the photo in this wish for an example of what we need. 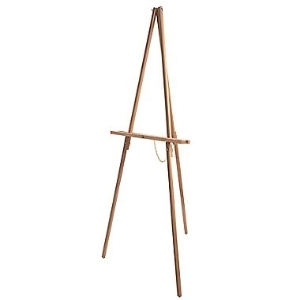 The easel should be able to hold 2-5 lbs. PLEASE CALL or email at 928-204-2808 or food@sedonafoodbank.org for details. Thank you! 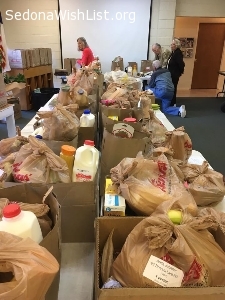 The school year is in full swing, and that means that every week, Sedona Community Food Bank volunteers Weekend Emergency Food Packs which are given to local schoolchildren who would otherwise go without adequate nutrition on weekends. You can HELP US by donating multiples (a dozen, a few dozen, a case, or more) of individual-serving-sized foods! 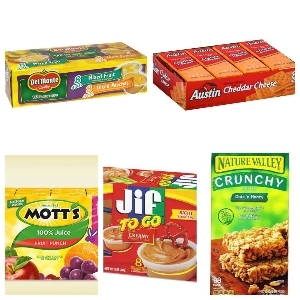 In particular Jif-to-Go peanut butter snacks, oatmeal packets, fruit cups, individual cereals, 100% Fruit Juice boxes, small shelf-stable milk are all great choices. Drop your donations off at the food bank 9-1, Monday - Thursday. Call us at 928-204-2808 for more information. 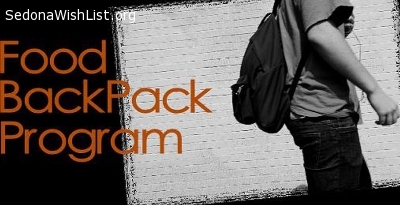 To read about this great Emergency Food Pack program, go to http://sedonafoodbank.org/food-backpack-program. Please help us help our youngest neighbors in need! Volunteer need are fulfilled for now! Thank you to everyone who responded to our call for volunteers. Right now, Sedona Community Food Bank is humming right along, with our happy, hardworking volunteers making it possible for us to help our neighbors in need. 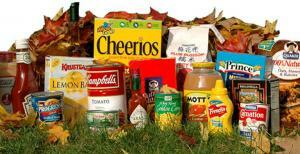 Adopt/Sponsor a Weekend Food Pack for a Child! Would you like to make a real difference in someone's life? Sponsor a child's Weekend Emergency Food Pack! $20 fills a weekend backpack for one local child for 1 MONTH! Why not sponsor 2, 3, or more months? Each pack is filled with carefully chosen, nutritious single-sized, easy-to-make or ready-to-eat foods, providing much-needed weekend nourishment for a child who would otherwise go without. Simply write your check, noting "Weekend Packs" on the Memo line, and mail to Sedona Community Food Bank, PO Box 3962, Sedona AZ 86340. You can also donate online http://sedonafoodbank.org/food-backpack-program/ - but PLEASE CALL CATHLEEN at 928-204-2808 to let her know that your donation is to be earmarked for the Weekend Packs. A huge thank you to the community of Sedona. We have received two offers for refrigerators and both came in the nick of time.